Here’s how to disable iOS 10 Press home to unlock / open on the lock screen and revert it back to iOS 9-style one-click unlocking on iPhone, iPad or iPod touch. If you’ve been using the second-generation Touch ID sensor embedded in the iPhone 6s, iPhone 6s Plus, iPhone 7, iPhone 7 Plus or iPad Pro, then you’re probably used to getting extremely frustrated at how quickly it reacts to the detection of a stored fingerprint to unlock the device. You may have only wanted to check the time, but time and time again you’ve ended up on the Home screen. iOS 10 changes that with its “Press home to unlock / open” functionality and “Raise to Wake” functionality, but that may not suite everyone’s needs. If you are planning on getting your device up and running with iOS 10, but really don’t want to interact with the new way to unlock your iPhone or iPad, whether that be out of fear of wearing the Home button out, or just because you don’t necessarily think it’s a good implementation, then you can always fall back to the tried and trusted default method of resting your finger onto the Touch ID/Home button via Apple’s Accessibility settings in iOS 10. Not many people running iOS 10 betas were instantly aware of Apple having bundled in the older method, with the new “Press home to unlock” / “Press home to open” feature being enabled by default. Here’s how you can revert back to the older, rest finger option. Step 1: As with most processes that involve changing, disabling, or enabling something in iOS, our journey begins in the native Settings application. Launch the app to begin the process. Step 2: When in Settings, navigate to General > Accessibility. Step 3: Accessibility is literally packed full of options and really excellent things that individuals can use to make the iOS system a nicer place to be. However, in this instance, we are concerned with the section titled Home Button. Tap on that cell to continue. 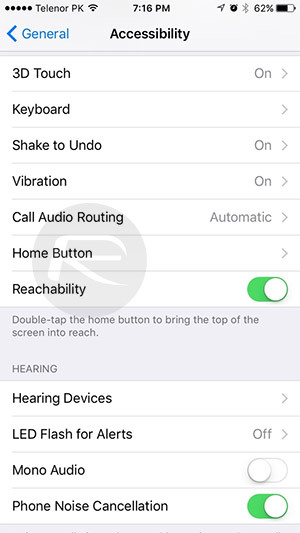 Step 4: At the bottom of the Home Button preferences is an option that’s titled Rest Finger to Open. Apple defines this feature as “open iPhone with Touch ID, without having to press the Home button.” So essentially, it takes the unlocking of the device back to the older method of simply resting the finger on the Touch ID/Home button. Toggle the Rest Finger to Open switch to the On position in order to enable this functionality and disable iOS 10’s default “Press home to unlock” / “Press home to open” feature. If you eventually get bored of this, and want to embrace iOS 10 in its entirety, then you can of course just toggle that setting off to revert back to how iOS 10 is intended to work by design. Any idea how to disable iCloud music from being the default in the music app? Searched hi and low still no luck. yay finally useful info i’ve actually used when i read this. 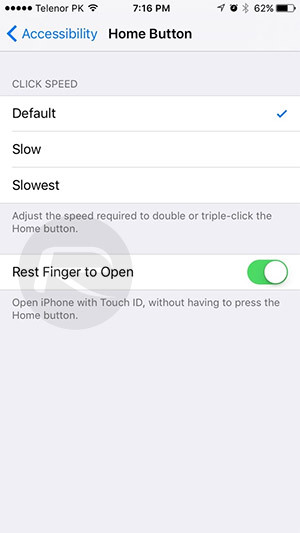 this does not work on iphone 5 because it does not show the “rest finger to open” option. any additional tips? thanks! its only applicable with devices that has the feature of Tocuh ID !! The iPhone 5 does not have the fingerprint scanner feature, silly! How can you do what? You wake the device like normal then swipe. This article has nothing to do with non TouchID devices. He said NON finger scan devices.